This chair was amazing! I recently purchased for my daughters desk and so far I love it. It is very comfortable and came exactly the way I expected it too, unlike other sites where the website image may look somewhat different. Improve the look and functionality of your office space with this ergonomic office chair by Boss. Designed to keep you comfortable as you work, this armless office chair features a generously quilted back and seat with tufted accents. This chair just feels good. The color is fabulous...l took a chance on the green/teal and it worked out. The splash of color in my office is still making me smile. For me personally the chair is really comfortable, although friends thought it needed a pillow because of the depth of the seat. I find it perfect for my long legs. Also where the lower back support is works well for me, a smallish woman. I don't know how comfortable it would be for a larger person. The seat is comfortable and wide and l love playing my ukuleles in an armless, comfortable, swiveling chair. Also, l was concerned about putting it together so l asked my 50 year old, small but strong woman friend to help me. She used cushions and a chair to support the proper angle needed to attach the seat to the back. She did it single handedly with a phillips screwdriver in 20 minutes. I put the rollers on the bottom! If you are looking for a comfortable chair that has the "Looks" to go with it, then look no further. This chair is AWESOME!!! I absolutely LOVE this chair. I ordered Taupe and received the gray one but was THRILLED as my new rug from Overstock was gray and my hubby LOVED the color with the rug. I made a call to Overstock and they gave me a discount for mistake and I kept the chair and have never regretted it. In fact, I'm sitting in it right now as it's in my new home office. The whole family is benefitting from this chair. This chair replaced my Target chair and there isn't even a comparison in comfort. Love the looks of it too. Goes with my new "Cottage" office perfectly!! 2 Thumbs up for this chair!!! I wasn't sure I would keep this chair when I opened the box. The color was darker than the picture. I have a quilt in my bedroom that I wanted this chair to coordinate with. Upon examination of the quilt I found the chair coordinates quite nicely with the teal undertones. I would call the chair more turquoise or teal than a true green, especially in natural light. It was easy to assemble, though it took a bit of muscle to attach the seat to the back. I'm a little curious about the extra holes pre-drilled into the seat. Overall, quite pleased with my purchase. I love this chair! It's comfortable, not as heavy looking as a regular office chair so it opens up the room. It's beautiful! Hello! I bought this chair in the green color and I LOVE it. The color is beautiful, a nice blend between a kelly green and an aqua....not too green, not too bluish aqua but just right! The comfort of this chair is amazing. It's firm and supportive. The wheels turn and swivel perfectly (my flooring is a vinyl laminate, no office mat). I can't speak for the longevity of this chair as I haven't even owned it for a month yet but It feels very sturdy and well made. It is being used in a home office. My husband put it together and said it was straight forward and not difficult. Just what I wanted. Armless yet ergonomic. This chair is comfy, easy to assemble and a wonderful splash of color in my home office! It sparks my joy every time I enter the room. Bonus: it fits under the desk beautifully allowing for more space in the room. I bought the green chair, hoping it would be more turquoise...and it is. Perfect for what I wanted and very comfortable. Easy to put together. Love it!! This chair is perfect for me. I'm a medical transcriptionist who works at home, and I needed something that would give me good back support without being too confining. I'm only 5'1", so I have the chair somewhat low so that I can comfortably reach my foot pedal, but there is plenty of room to raise the chair up higher for a taller person. The fabric feels comfortable, yet sturdy, and I am very pleased with the color. I think this is a GREAT buy for the cost and quality, and my husband had no trouble putting it together. Would definitely recommend this chair. Great color and comfort for office chair. This chair matches my furniture and overall style in the living room. It is very simple, comfy, supports lower back and allows me to work at the table long hours. I purchased 4 office chairs yesterday - 2 in taupe and two in slate to match office chairs we ordered from overstock last week. All four chairs delivered today were slate gray even though the boxes are marked correctly. Very impressed with the price and delivery... not so impressed that we were shipped the incorrect colors. They have already been assembled, so there is no point in returning them. Also must note there no way someone could put these together alone... it took at least two people to hold the back to the seat and screw it in. The plus is they are cute and comfortable! This chair is simply fantastic...very comfortable for both myself and husband. I am quite petite and he is built so it can fit and work for different body structures. Very pleased with this chair. Very convenient chair. Good quality. Perfect for any home office. Comfortable l! We purchased this chair for my sons room and he loves it. He uses it everyday and says that it’s very comfortable. I would definitely purchase this chair again. Comfortable and easy to assemble. Works great at the small writing desk I needed it for. I ordered the green and it matches perfect with our decor. Great price and fast delivery. This chair is great. I got the light blue and it's pretty (but it does stain easily). Also surprisingly comfortable for a chair at this price point. Looks modern and rolls really good. Easy to assemble. Perfect for a small desk area. Plan to get another one! Little bit concerned that the back won't stay. The screws were not easy to match up on the back. Needed to be longer. So far so good though. "my desk is quite low, can you tell me how far off the ground the seat is, when it's in it's lowest position? thanks so much"
"What are the measurements for the seat. Width and depth. I assume the 33” includes the feet of the chair. " "What is the height of the seat cushion from the ground to the seat?" "Can the castors be removed? I want to replace them with bell glides to make a non-rolling chair." "What tools are need for assembly, if any?" "The Taupe color looks like a light grey - is it more brown or grey?" It's darker than the picture shows, more of a light greyish-brown. The taupe chair in real life looks exactly like .the color it looks on my computer screen----light grey. It has a spring tilt mechanism. 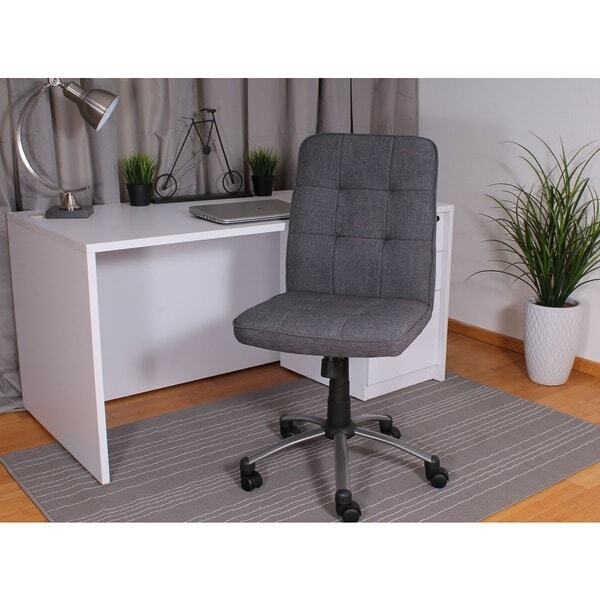 How to Adjust the Height of an Office Chair from Overstock.com. Our guides provide customers with information about how to adjust the height of an office chair. How to Clean the Wheels of a Rolling Office Chair from Overstock.com. Our guides provide customers with information about how to clean the wheels of a rolling office chair.